Laser technology offers an alternative to eyeglasses and contact lenses for a variety of patients. Dr. Lucy has guided hundreds of patients through refractive surgery with comprehensive pre-operative and post-operative care. PRK stands for Photorefractive Keratectomy. During this procedure, the surgeon gently removes the top layer of cells on the cornea. The excimer laser is then used to sculpt the cornea by removing microscopic layers of tissue. 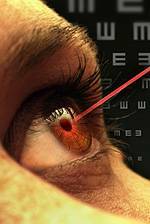 LASIK stands for Laser Assisted Intrastromal Keratomileusis. During this procedure, the surgeon uses an instrument called a microkeratome to create a thin flap of tissue within the cornea. The corneal flap is then returned to its original position, adhering without stitches. This procedure is nearly painless and is performed under topical anesthesia. Candidates should be at least 18 years old with a stable prescription. They must be within the range of the procedure, have no active eye disease and not be pregnant or nursing. After the procedure, you will find less dependence on glasses (e.g. having the ability to see the clock without spectacle correction or being able to swim without contacts). You should be able to enjoy an active lifestyle without being totally dependent on corrective lenses. LASIK not your thing? Ask us about non-invasive Ortho-K!